We are undoubtedly in one of the most prolific environments for termites. The Eastern Subterranean Termite is very common and most homeowners in Scottsdale, Fountain Hills, Carefree, Cave Creek, and Mesa are familiar with their invasive tendencies. Subterranean termites build shelter tubes that begin at the soil and provide cover for termites to reach a food source above ground. Often we see these tubes at the stem wall of the home, trailing into the wood framework or protruding from the drywall at the interior of the home. They will use the material they chew through to build these tubes as a means of protection from the atmosphere, which can quickly dehydrate a termite. 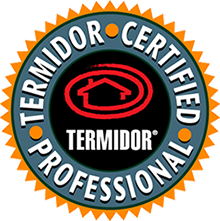 Termite treatment estimates by our state certified inspectors are provided at no charge. We pride ourselves on our ability to find even the smallest of evidence and we encourage our customers to have us out to get a pair of trained eyes on the property. Early detection is the key to minimizing any damage. Upon discovery of these tubes, an individual is advised to seek professional counsel to entertain treatment options. Left untreated, subterranean termites will continue to eat cellulose based materials (i.e. wood, newspaper, cardboard, etc.) until it affects the structural integrity of the food source. Termites are highly social and we are able to use this behavior against them by treating with a product that transfers from one termite to the next. This method effectively works to eliminate termite colonies from the inside out. This technology, coupled with years of experience of our field technicians, gives us an advantage that protects your home.